So… there’s a lot of coffee shops in San Francisco. And this may be an understatement. I thought there were lots in Seattle, but no, I think there are more in San Francisco. And while there are lots of chains like Starbucks, Peets, etc, there are many more independent shops, and small local chains. 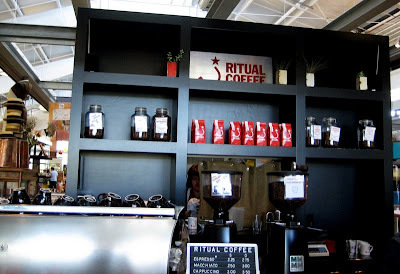 One of the better ones we discovered is Ritual Coffee. These pics are from their site at Oxbow. We also visited a shop in the Mission, located far down on Valencia. They’re serious about their coffee here. They pick their own beans, roast it on their own, and take painstaking steps in brewing the finest cup. Plus, we dig their logo and the aesthetic of their shops. The menu options are few. You can also buy beans and paraphernalia to take home. 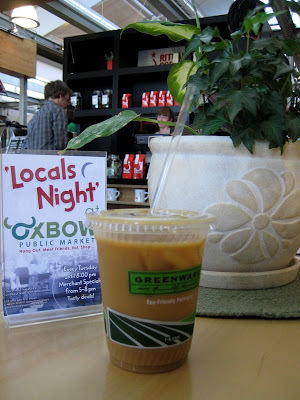 A simple iced coffee, served in green cups. These are the ones made from corn, so they’re completely compostable. These coffees are strong, but not bitter, and super smooth. They brew a mean cup. 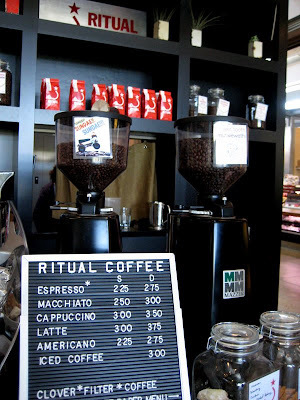 If I had to choose between Blue Bottle and Ritual, I think I’d have to go with Ritual. It’s just a gut feel.